Viv Biz Club Blog: Is Plastic Food Packaging Preventing our Local Businesses from Composting? Is Plastic Food Packaging Preventing our Local Businesses from Composting? We recently had an interesting exchange with another member of a sustainability group. Kathy W. said: "Any hope for composting movie theater trash? I have a client that generates a lot of trash at their multiple locations. We've got them recycling the cardboard and larger plastics, but the bulk of their waste is from the snack bar. There is nothing clean about any of it: nacho cheese sauce on boxes, popcorn, cups with soda, etc. Is there any hope to help them compost or otherwise recycle this mess? They do not, under their current staffing levels, have the time or manpower - or even storage space - for sorting. I welcome any suggestions!" (this is the most important point) Pasted onto these signs are the actual objects that are supposed to go in either the recycling or composting bin. This is an amazing visual cue for customers and it's very effective at getting the waste into the right bins. 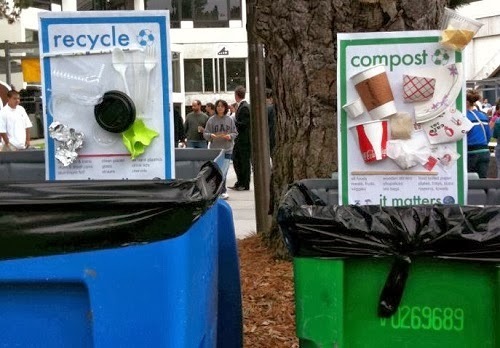 Switch to compostable food packaging - If you're municipality will not recycle your plastic soda cups, lids, styrofoam containers, etc, then move to compostables. Most of these items come with some form of labeling (typically a green-stripe) and while it may take some effort to get your customers to place them in the correct bin, good signage will go a long way. Remove your trash can or make it dramatically smaller. Let's take the example of a movie theatre. They should be able to use compostable containers made from PLA-lined paper or bagasse for all their popcorn, hot dogs, nachos, etc. Soda cups, straws, and lids could all be made out of compostable PLA. The trouble is, you still have all those plastic snack wrappers and you're not going to get the snack companies to move away from those over night. So what do you do? How about reducing the size of your trash can by 3X and leaving just a very small hole only large enough for a crumpled up snack wrapper. This will make customers think twice the next time they throw something away and should prevent the vast majority of your larger compostable and recylable containers from being put in the wrong bin. Plastic Food Packaging may be unnecessary, tough to get rid of, and bad for our environment, but it doesn't have to prevent us from diverting 80-90%+ of our waste to recycling or composting bins. PS - I mentioned to Kathy that some snack manufacturers, like SunChips, have already moved to compostable bags, and that maybe they should be working with SunChips more. What did she say: "I mentioned the Sun Chips bag and my client laughed -- 'Do you know how loud that new packaging is? ', he said. Not a good fit for a movie theatre." Ha. Guess she has a point there.